We are very proud to be recognized by highly respected organizations in the parenting industry. The Baby Manual™, which includes our Breastfeeding Program and Healthy Sleep Program, is the winner of the prestigious Mom’s Choice Award® for excellence in the category of family-friendly media products and services. What is The Mom’s Choice Awards®? The Mom’s Choice Awards® (MCA) organization evaluates products and services created for children, families and educators. The program is globally recognized for establishing the benchmark of excellence in family-friendly media, products and services. The organization is based in the United States and has reviewed thousands of entries from more than 55 countries. Around the world, parents, educators, retailers and members of the media look for the MCA mother-and-child Honoring Excellence seal of approval (shown above) when selecting quality products and services for children and families. What is the evaluation process and selection criteria? An esteemed panel of evaluators, including educators, media professional, parents, children, librarians, performing artists, producers, medical and business professionals, authors, scientists and others volunteer their time and are bound by a strict code of ethics, which ensures expert and objective analysis free from any manufacturer association. The evaluation process uses a proprietary methodology in which entries are scored on a number of elements including production quality, design, educational value, entertainment value, originality, appeal and cost. Each entry is judged on its own merit. MCA evaluators are especially interested in products that help families grow emotionally, physically and spiritually; are morally sound and promote good will; and are inspirational and uplifting. Unlike many other informational products that are created specifically for women, The Baby Manual™ is just as valuable for new fathers, which is why we’ve been awarded the well-recognized Mr. Dad Seal of Approval. What is the Mr. Dad Seal of Approval? 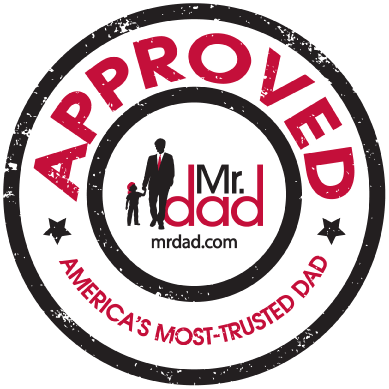 The Mr. Dad Seal of Approval is a visual endorsement that carries the powerful credibility of America’s leading authority on successful fatherhood. It was created to help fathers and families locate and identify products and services that are designed to improve family life. This Seal of Approval specifically recognizes products and services that give men the resources, tools, and information they need to be the fathers they want to be–and their families need them to be. We encourage you to take a look at the Testimonials page to hear from actual customers who provide even more support to the above noted awards. We are grateful and proud of the feedback we have received.